New York State plans on killing approximately 165,000 Canadian Geese. They want 17 other eastern states to participate in the killing of even more Canadian Geese. This is being driven by the US Airways flight that landed in the Hudson River in January of 2009 by Captain Skully. New York City officials believe that the population is 5 times too large. In 2009 NYC officials killed off 1,200 Canadian Geese around the airports to help alleviate the dangers to airlines. With Canadian Geese being migratory, this effort was futile. Presently, there are approximately 250,000 Canadian Geese in New York State. They want to reduce the population down to 85,000. With Canadian Geese being migratory, this effort is short-sighted. New York State officials claim that Canadian Geese do not have any predators. This simply is not true. Great-Horned Owls will kill smaller to medium sized Canadian Geese. 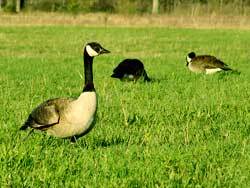 Other animals also prey on Canadian Geese. Other airports have used owls to scare off and kill off seagulls, ducks, and geese around airports with great success. Canadian Geese are protected by the Migratory Bird Act of 1918. They are protected by the Federal Government. New York State would need permission and a permit from the US Fish & Game to kill off the Canadian Geese. It is likely they would be able to get a permit.